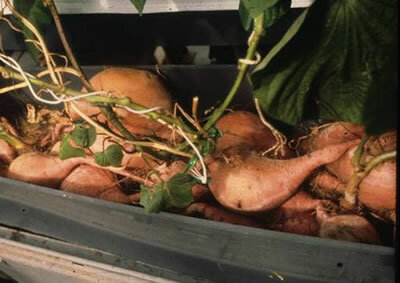 A little-publicized experiment in 1999 sent sweet potato cuttings into space aboard space shuttle Columbia. Findings from this five day mission study were not published until recently. Seeds of several crops have been grown in microgravity, but this was the first test for plants grown from cuttings. Cuttings grow roots faster than seeds do, and sweet potato cuttings regenerate very easily. This made them ideal for the study. According to the study authors, all of the cuttings produced roots and growth was "quite vigorous in both ground-based and flight samples." Except for a slight browning of some root tips in the flight samples, all of the stem cuttings appeared normal, they added. The roots on the flight cuttings tended to grow in random directions, sometimes perpendicular to the stems. 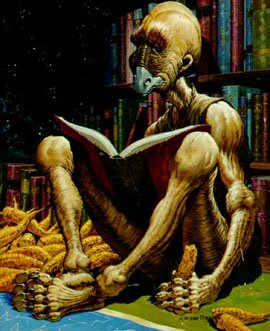 The interest of fans of sf writer Larry Niven are understandably piqued by this story. In several of his Known Space stories, he writes about the Pak. This race goes through several stages; child, breeder and Protector. The Protector stage is only reached when a mature Pak breeder encounters Tree-of-Life root; unable to resist gorging himself, the Pak infects himself with a virus that transforms him into the end stage of his race. Joints swell, skin turns leathery, strength increases and the brain grows. Don't forget the cranial ridge and beak. See the Pak Protector surrounded by Tree-of-Life root in the picture below. The fact that Tree-of-Life root looks just like sweet potatoes MAY just be a coincidence. On the other hand, keep a sharp eye out for older men with beaks who are efficient, ruthless and totally amoral in protecting everyone who smells like their children. Read more about science fiction foods; don't miss space beer and giant space vegetables. See Sweet potatoes flew into space on Columbia; thanks to an anonymous reader who submitted the tip on this story.